Of course there are a million and one ways to use Mr. Clean Magic Erasers. I use them for all sorts of things but today I want to share with you ways I use them to get my home holiday ready, just in time for guests. 1. Baking is almost a given around the holidays which means baked on chocolate drippings and dried up food bits everywhere. 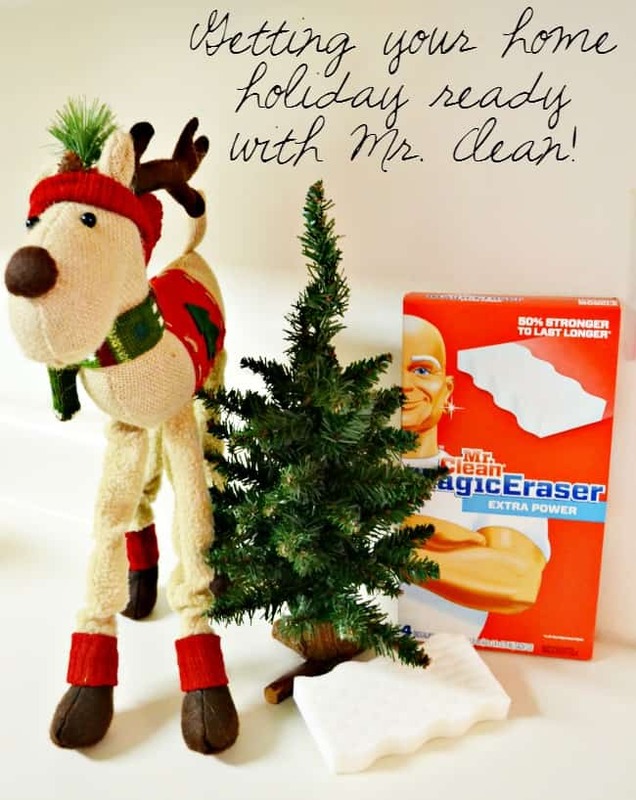 No fear, Mr. Clean magic erasers will wipe clean your laminate, granite and glass countertops. 2. Need to rinse clean those baked on casserole dishes? You guessed it, magic erasers can take care of that too. 3. My cookie sheets were stained for the longest time but guess what cleaned them up and had them looking nearly brand new? Yep! 4. Winter weather means wearing boots a lot around here. The unfortunate part about boots is that they leave scuff marks in their wake. No problem, Mr Clean magic erasers gets them up without even breaking a sweat. 5. Candle stick candles are really pretty but can leave behind a waxy mess. Mr. Clean works on that mess too. 6. I’m getting ready to wrap gifts but I am stuck with annoying price tag stickers on a few items. Let me break out my eraser! 7. Lastly, need something to keep the kids entertained while you are cleaning. Give them a few ceramic or glass bowls or plates and some colorful markers. Once they are finished you can leave them out to enjoy and after the holiday is over wash them up with Mr. Clean magic erasers and they are ready to go for your next holiday. This idea also works great for wine glasses too. I could keep going with all the different ways Mr. Clean Magic Erasers can be used but then we would definitely be here all night. I know that sounds tempting but we have cleaning to do. Christmas is right around the corner!! Check out Mr. Clean on Facebook and Twitter! Share how you clean with Mr. Clean and use the hastag, #MrCleanMillion. I am having people over on Christmas eve and my house needs a GOOD scrubbing. I will definitely be using Mr. Clean. I use Mr. Clean Magic Erasers all the time! My kids are so busy with “holiday” coloring everywhere, so I need to make sure I’m ready for clean up! We have used Magic Erasers on our walls, but I haven’t thought to use them like you did. Decorating plates then wiping off the design is a great idea! Wow. That does an awesome job. Love Mr Clean products. Magic Erasers are truly a god-send! I use them so much especially during the holidays when people are coming over – it makes cleaning up so much easier! I have guests coming and just loaded up on those Erasers. They have definitely gotten my home in shape for the holidays! I admit, I am kind of a lazy cleaner so these Mr Clean sponges are a must at my house. I use them so much. I love Mr. Clean products. The Magic Eraser works for so many things. I love using the Magic eraser in my shower and tub. It helps get rid of the scum that likes to stick there. I love Magic Erasers! They really are magic. Anything you can think of, pretty much, they can clean. Thanks for sharing how you use them! Mr Clean is for sure one of the most trusted brands I use. The magic eraser is so incredible! I have never used Mr Clean – I have heard great hings about how great it cleans. I am going to pick some of these up and get my house ready for company. There are so many great uses for them. I just bought some of the Magic Erasers last night. I had crayon in my dryer that I had to get rid of! Oh boy! How did it work out for you? Mr. Clean is a must product!! I LOVE the way he can save the day from terrible toddlers! I use Mr Clean ALL THE TIME. The Magic Erasers are clearly magical! I like the liquid Mr. Clean. It smells good, and works great too. I’ll have to try writing on wine glasses! I use magic erasers for so much around here. 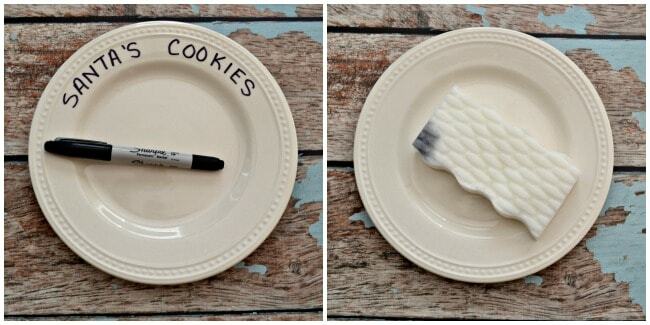 I love the personalize message on a plate idea with a sharpie! I would of never thought the Mr.Clean eraser would of gotten rid of that! Cool! Luckily, I am not hosting any holiday gatherings. But my holiday baking is still taking a toll on my kitchen.